A PEACH OF A SUMMER DESSERT! Delicious ripe peaches, one of the summer’s sweetest and juiciest treats of the season, become the perfect perch for plopping an irresistible, walnut-studded chocolate orb into the cavity of a peach half. Can anyone resist chocolate sweetened with nothing more than dates and flavored with almond extract? I sure can’t! Fresh, sun-ripened peaches play a key role in making this easy and naturally sweet dessert a top choice for a summertime treat. They look so tantalizing, chocolate fans will snap up these gorgeous stuffed peaches in a flash. The best part is that you won’t need to use the oven or stove-top to prepare this hot-weather dessert–it’s deliciously raw and can be assembled within minutes. And it doesn’t hurt that they look so inviting. I prefer the yellow peaches for this dessert for two reasons. First, they’re firmer and retain their shape and pleasing texture better than the white peaches. The second reason is they can be cut in half and separated without becoming mushy. They’re often called freestone peaches. Buy the peaches when quite firm and leave them on the kitchen counter at room temperature for only a day or two. That gives them just enough time to be ripe and ready for stuffing. Generally, white peaches have a higher water content and are not freestone. A day or two on the counter top and white peaches might turn into a mushy mess when you try to separate the two halves. I confess, though, that white peaches are mighty delicious and my family enjoys them thoroughly. The secret to separating the halves of white peaches is to cut them when quite firm and use a pairing knife to cut them off the pit. It’s a little tricky, but patience pays off. Overall, though, the yellow peaches are my first choice. After cutting the peaches in half, I prepare the chocolate stuffing by softening the pitted dates with a little water in the food processor. As I measure the dates, I snip each one in half with a kitchen scissors. That way I can find the one or two pits that were overlooked during the commercial processing–and it saves my processor blades from damage. Then I add the raw cacao or cocoa powder and almond extract and process to distribute the flavors thoroughly. The next step is to transfer the chocolate mixture to a bowl and add the coarsely chopped walnuts. For coarsely grinding the walnuts I use my inexpensive hand-crank nut mill that can be purchased in a well-stocked kitchen shop. Be sure to set aside some of the coarsely ground nuts for the topping. Now comes the fun part–rolling the chocolate mixture by hand into 1-inch balls and plunking them down into the peach cavity that’s ready and waiting for its sweet treat! Cut the peaches in half, discard the pits, and set aside. Put the dates in a food processor and pulse chop a few times. With the machine running, slowly add 2 tablespoons of the water and process until well mixed but still very slightly chunky, stopping occasionally to scrape down the work bowl. Add all or part of the remaining tablespoon of water only if needed to moisten the date mixture. Add the cacao and almond extract to the processor and process briefly until completely incorporated. Transfer the mixture to a medium bowl and stir in 3 to 4 tablespoons of the ground walnuts and mix well. Put the remaining ground walnuts into a separate small bowl. Using your hands, form the cacao mixture into twelve 1-inch balls. Press a ball into each of the peach halves. Holding the peach carefully, invert it and dip the top of each cacao ball into the ground walnuts to coat the top of the ball. Arrange the peach halves on an attractive serving platter. For the finishing touch, poke a golden raisin into the center of each cacao ball. Sprinkle any remaining nuts around the platter and garnish with the mint leaves. Summer desserts often spotlight fresh fruits as the center of the season’s sweet indulgences. Many of us home cooks, feeling a little weary of the long, long season of apples, pears, and oranges, really look forward to the refreshing flavors of stone fruits. They perk up the fruit bowl with their brilliant colors, and every bite is divinely sweet and juicy. A couple of weeks ago I went to the market on a hunt for fresh, ripe peaches with the hope they would also be sweet. Often, the first-of-the-season fruits tend to be a bit tart–and they were–so tart they even made my mouth pucker. On this week’s shopping trip I was thrilled to discover bins of beautiful yellow peaches with a gorgeous rosy glow. I bought some for my cooking class and had the pleasure of hearing the peaches were delicious and the dessert was a smashing success. This is a dessert I devised especially because it contained no sweeteners of any sort. The sweetness comes only from dates. It’s also gluten-free. Anyone wanting to avoid sugar or suffering from gluten intolerance will find this an ideal dessert because there’s no sacrifice–really–none at all because it’s decadently sweet and chocolaty rich without the offending ingredients. If allergies are a problem, just leave out the walnuts, and you’ll still have a fabulous dessert. Easy as pie–that’s how I think of this recipe, and I think you’ll agree. You can also make it a day in advance by brushing the exposed peach flesh lightly with lemon juice to prevent discoloring. The only tools you’ll need are a food processor and a hand-crank nut mill to grind the walnuts into a coarse meal. I’m pretty sure everyone knows what a food processor looks like, but I often encounter puzzled looks when I mention nut mill. If you don’t have one, you can use other tools, like a hammer, food chopper, rolling pin, or mini blender, to grind the walnuts into a coarse meal. 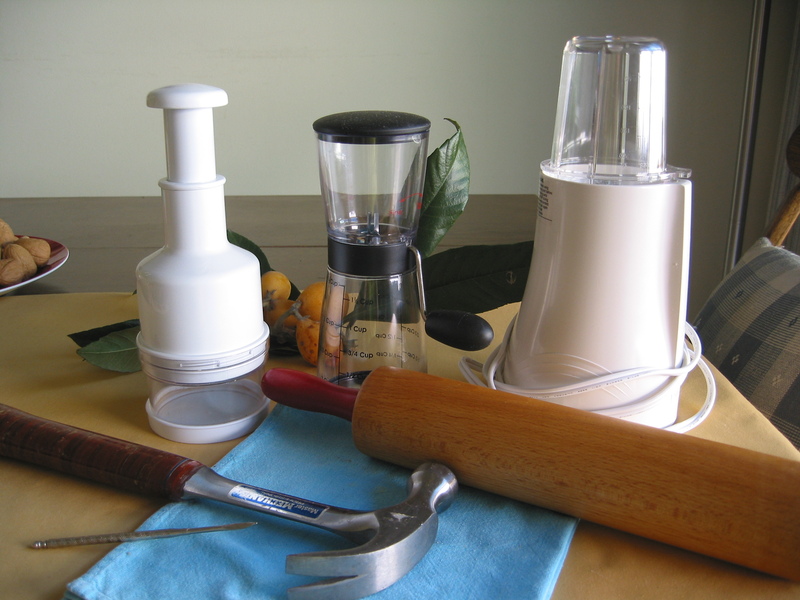 The nut mill is the item in the center of the photo and has a black cover and black handle on the end of the hand-crank. It’s a good old-fashioned low-tech tool, but turns out perfectly ground nuts I often use as garnish or to add a little texture to a recipe. And don’t skimp on the garnish! Those little finishing touches are what dazzle the eyes and ramp up the temptation meter. A few perky sprigs of fresh mint and some scattered nuts on the dish do the deed. 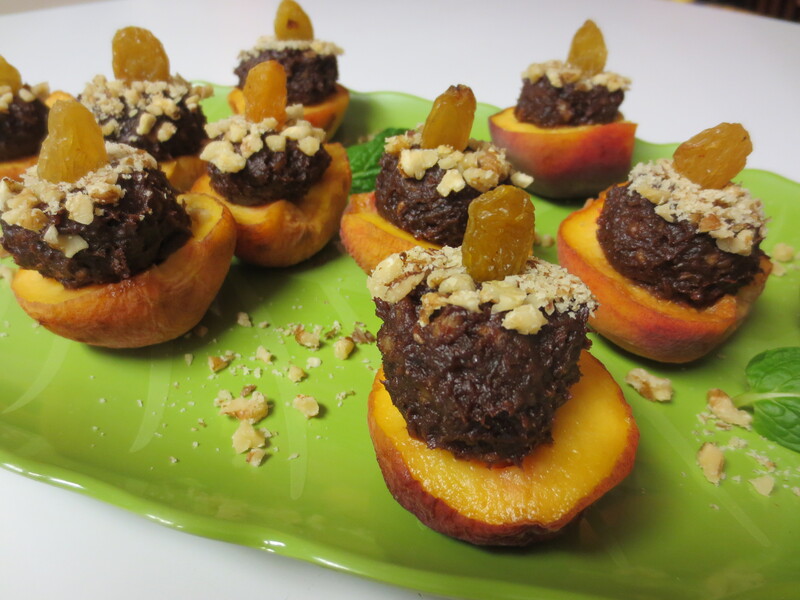 Well, here they are–fresh, sun-ripened peaches stuffed with indulgent chocolate all ready for dessert. They look so irresistible, chocolate fans will snap up these gorgeous treats in a flash. The best part is that you won’t need to use the oven or stovetop to prepare this hot-weather dessert–it’s deliciously raw and can be assembled within minutes. And it doesn’t hurt that they look so tantalizing. 1. Cut the peaches in half, discard the pits, and set aside. 2. Put the dates into a food processor and pulse chop a few times. With the machine running, slowly add 2 tablespoons of the water and process until well mixed but still very slightly chunky, stopping occasionally to scrape down the work bowl. Add all or part of the remaining tablespoon of water if needed to moisten the date mixture. 3. Add the cacao and almond extract to the processor and process briefly until completely incorporated. Transfer the mixture to a medium bowl and stir in 3 to 4 tablespoons of the ground walnuts and mix well. Put the remaining ground walnuts into a separate small bowl. 4. Using your hands, form the cacao mixture into twelve 1-inch balls. Press a ball into each of the peach halves. Holding the peach carefully, invert it and dip the top of each cacao ball into the ground walnuts to coat the top of the ball. Arrange the peach halves on an attractive serving platter. 5. For the finishing touch, poke a golden raisin into the center of each cacao ball. Sprinkle any remaining nuts around the platter and garnish with the mint leaves.